So you have decided to start blogging with your students. Congratulations! You are about to embark on an amazing learning journey. Your first step before introducing blogging into your classroom will be obtaining permission from your school, and parents or guardians. Ensuring you have the required permission is not only important from a legal perspective, but ensures all stakeholders are well informed and on board with your adventure. 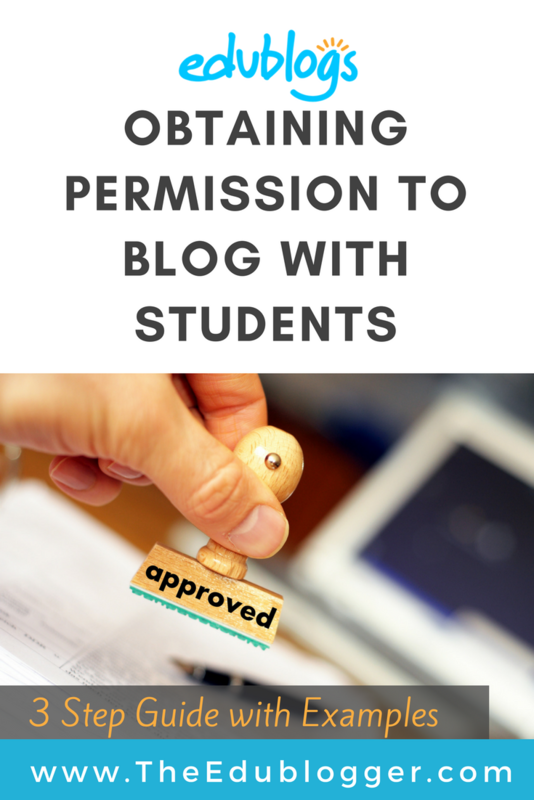 Here is some further general advice to help you navigate the process of obtaining permission to blog with your class. Edublogs’ users come from many different school districts and states all around the world. Legal advice and requirements vary greatly. It is essential that you consult with your own individual legislation prior to commencing blogging. The state of Victoria in Australia has their own CampusPress platform called Global2. It is managed by the Department of Education and open to all educators in state and Catholic schools. The Global2 website has a privacy page with information for teachers and schools looking to begin a blog with Global2. They stress that fully informed consent must be obtained and advise, “You and your school community are best placed to determine how to obtain fully informed consent.” The website also includes example wording to put in an acceptable use policy note for parents. Your own district or state guidelines may not be hosted online, like Global2. If in doubt, ask your principal or contact your Education Department and see what advice applies. Hopefully your school principal is already encouraging you and other staff to blog. If not, it’s a good idea to seek permission and engage in a discussion about how you see blogging being used in your classroom. If your principal is unfamiliar with blogging and you want to discuss the potential benefits of a blogging program, check out our post of Ten Reasons Every Educator Should Start Blogging. There is even a handy infographic summary which you could present to your school leaders. How you will use blogging. A good first step is often to start with a class blog before moving on to student blogs. This approach will allow you to develop blogging skills and confidence with your students, while maintaining control over what is being published online. Set up a class blog where teachers write posts and students comment and reply to comments. Allow students to write guest posts on the class blog. Create a system where keen students can earn their own blog (I used this approach with younger students and/or when we had limited computers in the classroom). When we had the technology and I was confident with student blogs, we created blogs for all students as digital portfolios (this was set up once students were familiar with our class blog). It’s important to work out what system would work for you and your students. Why you want to blog. While there are many advantages to blogging, you may want to consider your blog vision and how you’re using technology to transform your teaching and learning. The richest advantages of blogging often emerge when blogging is neither an add-on nor a substitution for pen and paper work. SAMR (substitution – augmentation – modification – redefinition/reflection) is a popular model to base this reflection on, but there are others as Michael Gorman recently described. Will your blog be public or private? Will you publish students’ photos and names? Will you match photos with names? Will you write posts and have students comment, or will students create posts too? Will you moderate all work and comments on the blog? How will you teach students to think before posting and prevent them from revealing personal information? You can find more advice and examples around blogging rules and guidelines in our teacher resource section. You may be following a long line of bloggers at your school, or you may be the pioneer. Back in 2008, I was the pioneer and while my school had a general ‘internet use’ permission form, I didn’t think it was enough to obtain fully informed consent. I came up with my own blogging parent permission form which has been frequently adapted by some members of our global education community over the years. This permission form has two parts. An actual permission note for parents to fill out and return to school. After obtaining permission I always begin educating parents about blogging. This is a crucial step in any classroom blogging program. Look out for a new post about how to inform and involve families in blogging soon. I have included samples of my information and permission notes below. Want to use these ideas or modify my notes and handouts for your classroom use? Go ahead! I have included a CC-BY-NC license for the PDF files. Simply credit me (Kathleen Morris) as the original author and link back to my blog (http://primarytech.global2.vic.edu.au). * Refer to our Educators’ Guide to Copyright, Fair Use and Creative Commons to find out more about using the work of others. While it is important to ensure that you collect full informed consent before you begin blogging, George Couros points out another important reminder. Ask the students. Do they want their work and photos online? This is another thought not to be overlooked in the permission process. How do you obtain permission to blog? Do you have any blogging guidelines, notes or resources you could share? Leave a comment below with any questions or advice. We’d love to hear from you. Good point, Cristina. I agree that lack of understanding or knowledge is the main reason parents don’t come on board. This included really great ideas. I especially like the idea of asking the students if they want their work published in the blog. Making sure everyone is on board is a great idea. Thanks, Vicki. Glad you found it helpful! Thank you for providing this very professional note. It is way more informative than the one I use. Thanks for sharing! Thank you so much! As I explore the idea of using blogging in my classes you have helped me to put in place the logistical framework needed to ensure the success of such an innovative project. Thanks again for providing great advice and insight regarding the logistics of it all. I will begin with a class blog. How exciting! I’m so glad to hear you’re ready to begin your blogging journey. Your students and families will love it. Please let us know if you need any help. Some parents certainly do worry. I found that providing ongoing education and encouraging them to ask questions etc really helps. Thanks very much for this information. It comes at a very important stage in our development of policy within our college. Very much appreciated. Thank you so much for taking the time to let us know! Good luck with your policy development. Great post. I have been class blogging for almost 10 years now and never really had an issue until last year when I moved down several grade levels from a grade6 to grade 3/4. There were 2 parents that refused to sign the blog permission form. Once I made a personal phone call to each parent and inquired about this, they revealed to me that they were nervous about personal information being revealed. After our conversation and speaking with me 1:1, they gave consent. Sometimes that is all it takes. That is excellent advice! I too have had experiences where parents were nervous but the issue was easily sorted out with a quick chat. I guess we really need to stress that parents should talk to us about any questions/concerns. Although sometimes we teachers really need to initiate this conversation, like you did. 10 years of blogging is amazing. Congratulations! Hope you can get started soon! I think you’re right about that. And this is the reason why my notes and guidelines etc developed over time. I guess they were pretty brief when I started! That’s a great quote from Lois.